“A Christian should use these arts to the glory of God, not just as tracts, mind you, but as things of beauty to the praise of God. An art work can be a doxology in itself. The image in my email this morning took my breath away. It literally elicited an expression of praise to God—a doxology. My friend Linda Mullen sent this image of her latest watercolor painting to me, saying she had gotten up early to finish it. Two words here catch my attention right away: early and finish. As long as I have known her, which is now close to 40 years, Linda is up early, sitting in the presence of God with an open Bible, an open notebook, and an open heart. She spends the first few hours of her day being still and listening. Her love relationship with our Father, the Creator of all—from galaxies to gladioli— is the basis for the joy reflected in this lovely watercolor painting. She is also a finisher, even when it is hard. She rose from her bed in the early morning just so she could finish this piece of artwork. Not because she had a client deadline. Just because it was a job God had given her to do and she was eager to get back to it, to experience the joy of stepping back and knowing she had brought it to completion with the help and guidance of the Holy Spirit. I’ve also heard her bemoan the waste of numerous sheets of expensive watercolor paper as she starts and restarts paintings that don’t work out the first, second, or even fifth time. The thing is, she may throw what translates into numerous hours of work in the trash, but she always takes up another sheet of paper in order to finish the work God has given her to do. As anyone who has been given artistic and musical talents to develop eventually discovers, much creative work is actually arduous, tenuous, and tedious. But she does it, day after day, year after year. 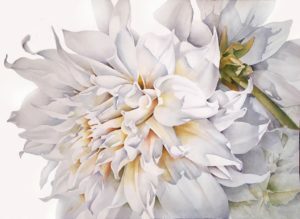 As an example, look closely at this exquisite painting Linda named “Just for the the Beauty of It”. Take a moment to examine the detail and subtle shades of color in each of these petals. Try to imagine how long it took to complete this stunning interpretation of one of God’s gifts to us of flowers! 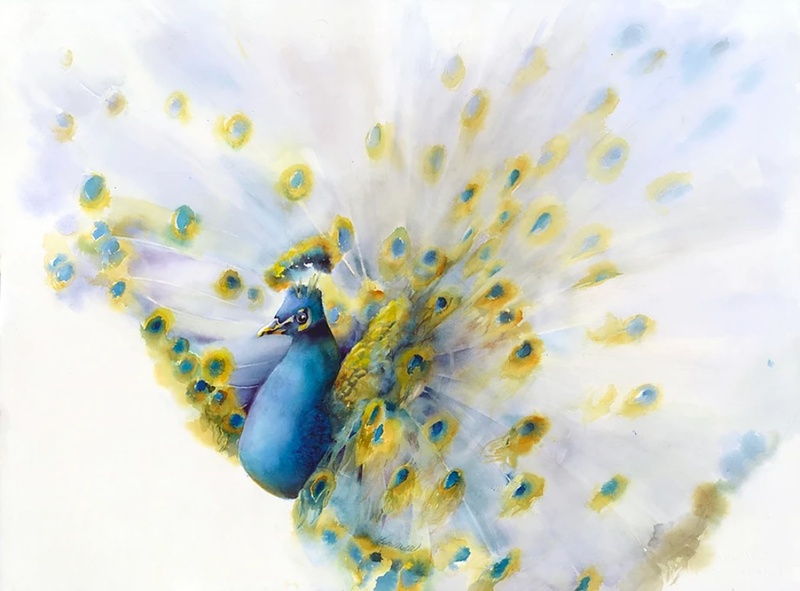 Or her peacock portrait called Majesty. How on earth does she take a flat piece of paper, a bit of pigment and a splash of water and create something so delicately textured and ethereal? I will tell you how. Her gift was given to her as a talent to develop for the purpose of blessing others and glorifying her Creator. 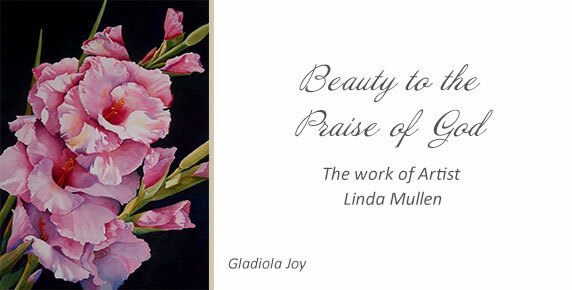 Linda Mullen is one of God’s anointed and skilled artists who faithfully works on her craft in relative obscurity. Those of us who call her friend marvel that God has, so far, allowed her brilliance to be largely hidden from public view. But she is undeterred. She just keeps on painting year after year because, like the rose that blooms because that is what it was created to do, she has to. Moreover, she wants to. It brings her joy. It is the work God has given her to do to bring him glory on the earth. Exodus 31 is the first mention of God’s anointing of artists and artisans. Bezalel was identified as one whom God had “filled with the Spirit of God, giving him great wisdom, ability and expertise in all kinds of crafts.” He was the one God appointed to oversee the construction of the tabernacle in the wilderness, along with all its elaborate furnishings, embroidered linen curtains, and detailed priestly garments. If the immense variety, color, texture, and sheer gorgeousness of nature did not convince us that God cares about aesthetics, surely his precise attention to the design in the house that would be his on earth should. Exodus 31:6b goes on to say, “Moreover I have given special skill to all the gifted craftsmen so they can make the things I have commanded you to make.” The names of these artists who worked with the colors and designs God dictated were not recorded in Scripture, but their work contributed greatly to the worship of God. Similarly, Linda’s handiwork contributes greatly to our worship of God. As she first observes and then paints the details in nature that most of us would fail to notice, she serves God and man by pointing to the magnificence of creation. This is what it means glorify God. 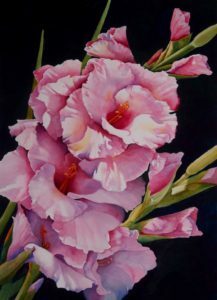 I find it significant that in the language of flowers, the gladiola symbolizes strength of character, faithfulness, sincerity, and integrity. It speaks of honor and remembrance. These are all attributes reflected not only in Linda’s painting, but in her life as a servant of God. She honors God by developing her talent and causes us to attend to and remember his majesty in nature. I am glad she never gives up her job of adding to the beauty here on earth. So pray for her and for all who’ve been given creative giftings to nurture. Pray that for each faithful brushstroke, there will be someone who sees the Almighty hand that guides her hand, and will give thanks to God for the gifts he gives to his children. The Amen of nature is always a flower. – Oliver Wendall Holmes, Sr.